Chiusura strada E45 tra Balze e Valsavignone, chi proviene da Cesena deve uscire a Bagno di Romagna e fare il Passo dei Mandrioli. La Verna Sanctuary is located in the Tuscan Apennines. The mount covered with a monumental fir and beech trees forest, is characterized by an unmistakable appearance thanks to its summit (1283 sea level) bending in sheer drop over the valley. Over the sheer cliff and wrapped around by a surrounding wood we can find the hole unit of the Sanctuary, which cherishes several art, culture and history treasures inside its massive and articulated structure. 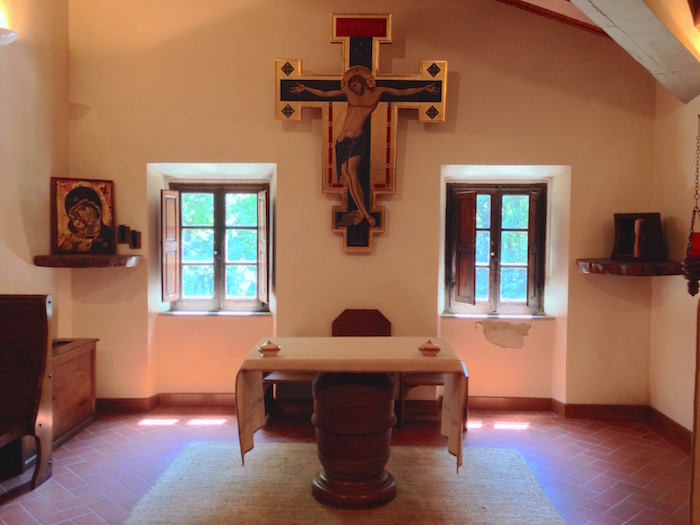 In the summer of 1224 St. Francis withdrew on the mountain for his ordinary spiritual exercises and silence. During his stay, he asked God to be able to take part, from the very deep of his heart, of the Passion of Christ, mystery of both love and pain. The Lord paid attention to his words and appeared to him in the guise of a crucified seraph who gave him as a gift the seals of the Passion. 'Francesco' turned into a visible and concrete image of Christ, not only in his heart, mind and soul, which already were, but even in his exterior body. 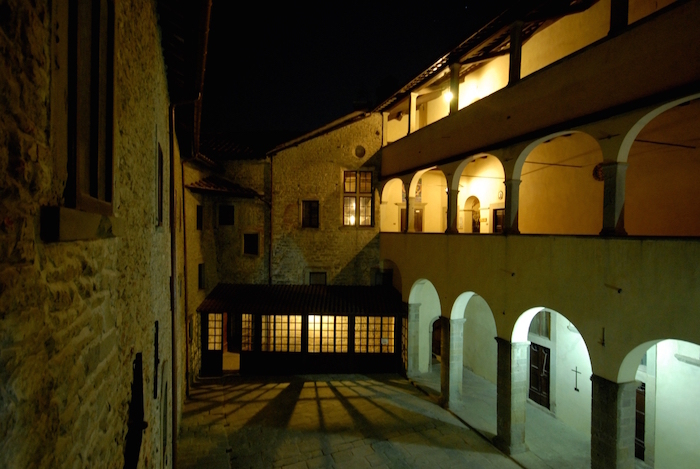 The Stigmata episode together with Francis' lifestyle are the most precious things given to his friars at La Verna. 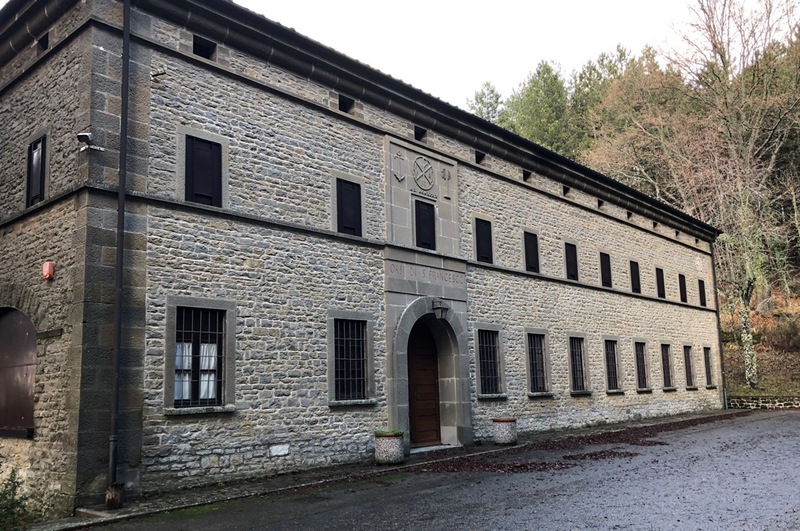 St Francis’ important spiritual heir not only deals with every single friar in the monastery, but it turns into the main vehicle which the community wants to convey to all those who visit la Verna. La comunità della Verna accoglie volentieri tutti quelli che salgono sul Monte, ed in modo particolare i pellegrini che vengono per cercare un tempo di preghiera e riflessione ed essere aiutati dalla presenza di San Francesco. Alla Verna è possibile partecipare alla preghiera e alle celebrazioni dei frati. I frati sono disponibili per le confessioni, per la guida al Santuario oppure per colloqui. Aiutaci con il tuo contributo a custodire questo luogo caro a tutta l'umanità sostenendoci nelle tante spese necessarie al mantenimento di tutto il Santuario. Per coloro che volessero fermarsi per un periodo nel Santuario, ci sono a disposizione molteplici tipologie di accoglienza. La Verna è un luogo di spiritualità e pellegrinaggio, pertanto cerchiamo di mantenere i servizi e le modalità di permanenza conformi alla natura del luogo. 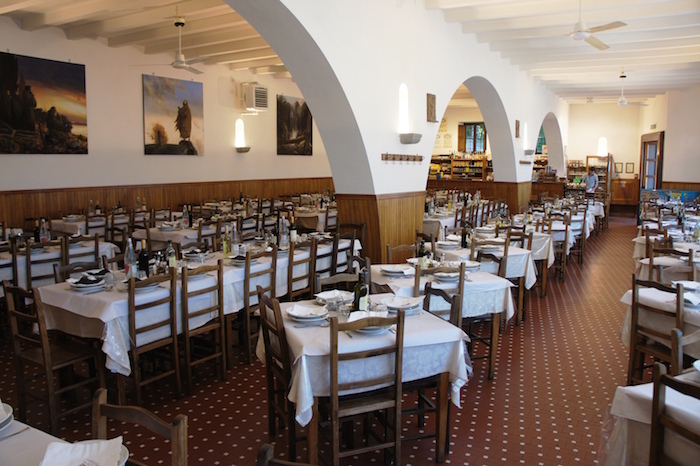 Nella foresteria del convento e nel Refettorio del Pellegrino i singoli e gruppi possono ristorarsi. 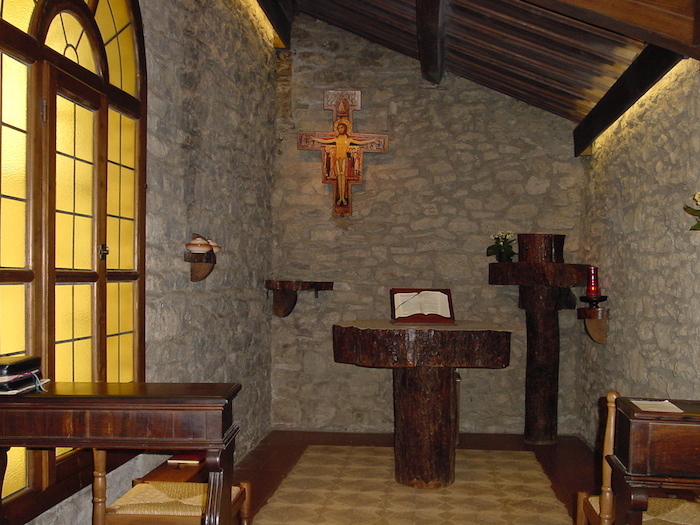 For individuals, families and groups willing to spend a few days at la Verna to rest and pray together with the friars. 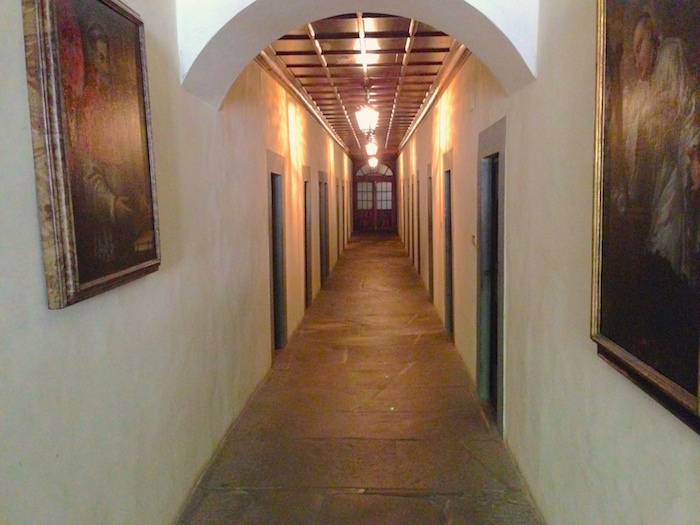 The Pilgrim’s Refectory is open all year and it has many halls available whereas other halls are opened only if necessary or in great influx of public periods. Here, people can have a meal or bar service at an affordable price. Bellissima struttura situata a 3 km dal Santuario, in mezzo al bosco, adatta per singoli, famiglie e gruppi che desiderano trascorrere qualche giorno di riposo o di ritiro all'ombra del Santuario, in un luogo tranquillo, adatto anche per convegni ed esercizi spirituali. Indicated for self-management groups who want to take advantage of a site so rich in spirituality. 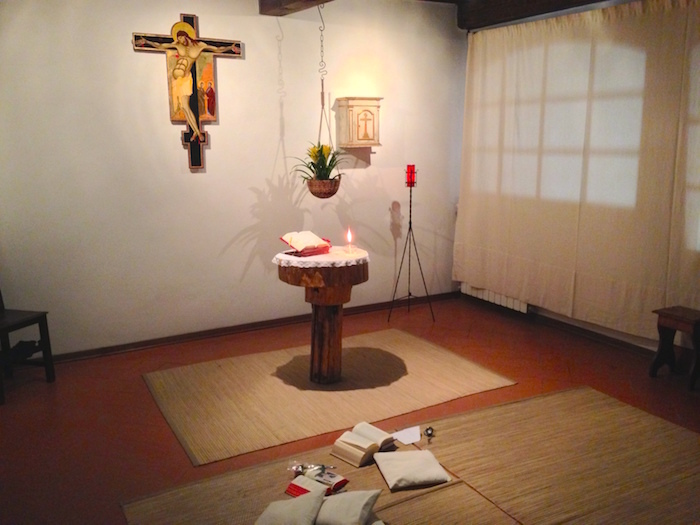 For friars, religious, priests, seminarians who want to rest or wish a spiritual retreat in fraternity with the Franciscan Community. Indicated for priests and religious longing for live an absorbed prayer period, according to the nature of St. Francesco. A concrete offer of silence, introduction to prayer and a way of seeking God’s will in everyone’s lives oriented to young people, both males and females. Presso il Santuario sono organizzati eventi e iniziative di vario genere come gli Esercizi Spirituali, corsi vocazionali per giovani approfondimenti biblici e convegni. The la Verna Sanctuary is situated in the Tuscan Apennines. The mountain, which is covered with a monumental fir and beech trees forest, is characterized by an unmistakable appearance thanks to its summit (1283 sea level) bending in sheer drop over the valley. Over the sheer cliff and wrapped around by a surrounding wood we can find the hole unit of the Sanctuary, which cherishes several art, culture and history treasures inside its massive and articulated structure.